Summer Noise is bringing on the heat this May. To continue showcasing a mix of talented artists shining across the region, local production crew The Rest is Noise is bringing together Singapore's Sobs and Subsonic Eye and Taiwan's Manic Sheep and SEN to share the Greenfield District stage with local favorites UDD, Cynthia Alexander, tide/edit, The Ringmaster, She's Only Sixteen, and UPRISING on May 18 (Saturday). They join previously announced acts Last Dinosaurs (AUS), Phum Viphurit (TH), Turnover (US), Japanese Breakfast (US), and Jakob Ogawa (NO). 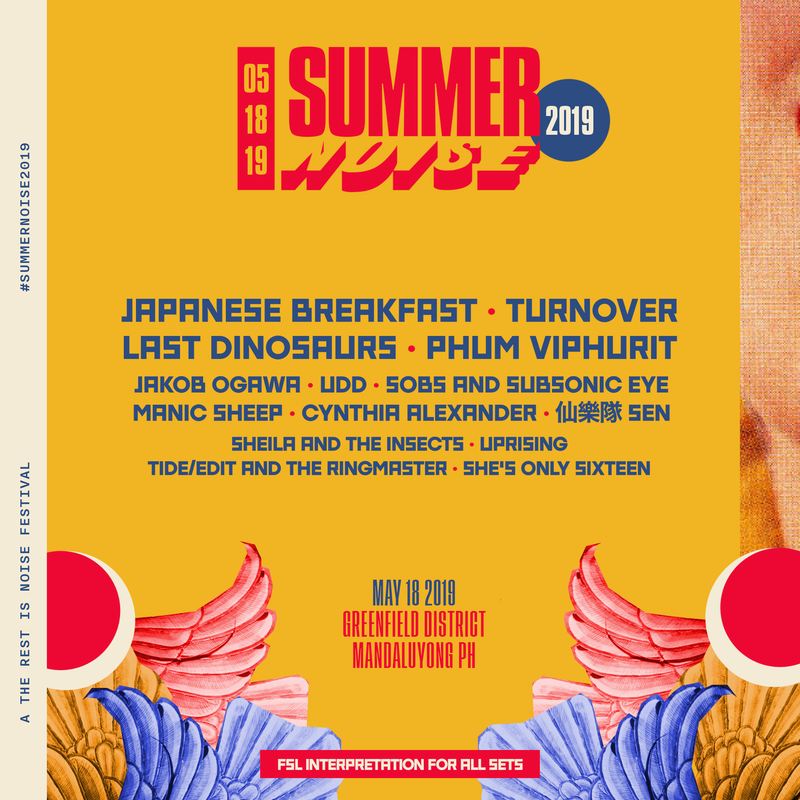 "Our goal with Summer Noise is to showcase established and independent musicians from various countries, particularly within the region and beyond, and foster talents that are rarely given the platform to share their music at large-scale events," festival co-founder Mary Christine Galang says. "We believe this to be an incredible opportunity to not only produce a high-quality music festival but keep the spirit of grassroots community that we've built throughout almost four years in the industry, which we believe to be what sets us apart from other music events in the country, and hopefully expand that ethos throughout the Asian region and beyond. In the long run, we want to nurture a community that celebrates diversity, representation, and cultural pride." Tickets are available for 3,300 PHP (General Admission) and 5,500 PHP (VIP) via TRIN''s official website. Check out the official poster below for details. Summer Noise 2019 is happening on May 18, 2019 at Greenfield District. Tickets are now on sale via TRIN's official website.